Restorative dentistry is pretty much exactly what it sounds like: a branch of dentistry used in restoring your teeth as well as the way your smile looks and works. There are several restorative treatment options available to repair different dental and oral issues, including missing and failing teeth. You shouldn’t have to suffer through everyday tasks like eating and talking because of your smile. If you have gaps in your smile or dentures that won’t stay in place, it’s time to learn more about restorative dentistry. At Shorewood Family Dental Care, we offer several restorative dentistry solutions. We’ve highlighted our main restorative services below so you can learn more about each option before visiting our office to find out which one is right for you. Read on, then contact us to schedule your in-office consultation. While fillings are often a great way to restore a tooth after decay or trauma, sometimes they’re simply not enough. That’s when a dental crown becomes particularly useful. A dental crown is used to protect your tooth from further damage while giving you the ability to go back to living your life the way you did before your tooth was damaged. A bridge is a dental device used to replace a tooth after it is lost. A dental bridge is made up of a false tooth connected to two crowns that are placed over the teeth on either side of the missing or lost tooth. Both crowns and bridges use porcelain to reconstruct the tooth. They are made in a lab that uses an impression of your mouth. At Shorewood Family Dental Care, we use our ITERO machine to make a 3-D model of your mouth. We can then send that model to the lab so they can make precise, natural-looking crowns. Dental implants are a truly revolutionary way to replace one or more missing teeth. They’re the newest advancement in restorative dentistry and potentially a great option for you. Our dental implants are made of titanium and are surgically placed into your jawbone to replace the roots of the tooth you lost. Then they’re capped with a replacement tooth or teeth to completely restore the look and function of your smile. Because a dental implant bonds with your jawbone, they’re just as strong and stable as your healthy, natural teeth. They also protect your bone from the potential bone loss that can occur after a tooth is lost. 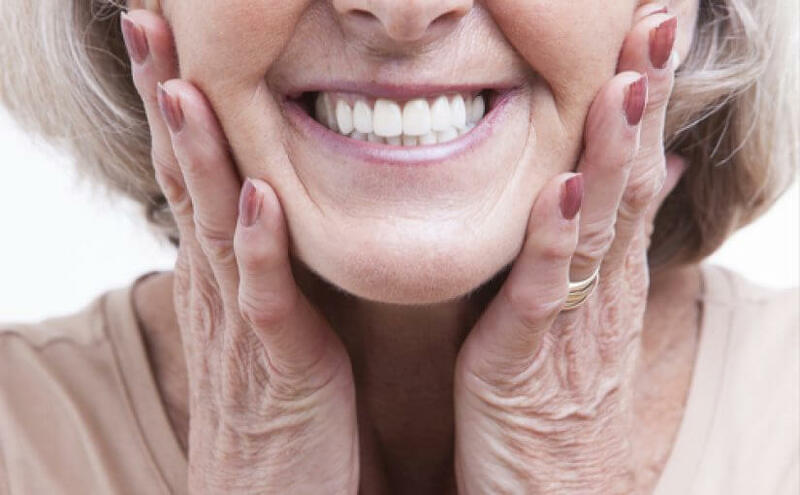 Whether you’ve been wearing dentures for years or are considering dentures as a restorative option, we offer several options to make your experience more comfortable. We even offer implant-supported dentures so you never have to worry about your dentures sliding out of place again! With implant-retained dentures, a series of implants are strategically placed in your jawbone, then topped with a bar or metal balls. Your new or modified dentures attach to the bar or balls, holding it in place. You can kiss your messy adhesives goodbye! That’s exactly what our full-mouth reconstruction is for! With full-mouth reconstruction, we can restore your ability to live without having to worry about your teeth. You’ll work closely with us to plan a series of reconstructive treatments to give you the smile of your dreams. In practically no time at all, you’ll have a smile you can be proud of. The only way to know for sure if you’re a candidate for restorative dentistry is to visit our Shorewood, IL office for a consultation. During your consultation, we can go over your dental issues and discuss your goals for the treatment. Then we’ll be able to come up with a treatment plan that’s just right for you, using any number of our restorative dentistry solutions. To learn more, call Shorewood Family Dental Care today at (815) 725-5991. You can also contact us online to request an appointment. We look forward to hearing from you!